DMG DMU 85 machine Our MONOBLOCK with Heidenhain control can machining parts up to a dimension of 590 mm x ø1040 high with round folding table as well as for parts up to 1200 x 1040 x 650 mm fixed table . 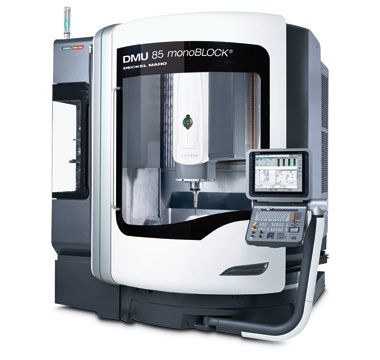 This offers a machine concept for all sectors : Whether with simultaneous 5-axis machining , with high-speed milling highly dynamic , with the cutting power of high torque or widely covered field manufacturing pieces with three to five axes. With the new machines monoBLOCK , all manufactured part will become a stunning masterpiece.